Are you a morning person? If so, and you’re blessed with clear skies, the next several mornings are for you. Just look east, the direction of sunrise. You’ll find the moon sliding by three bright morning planets. 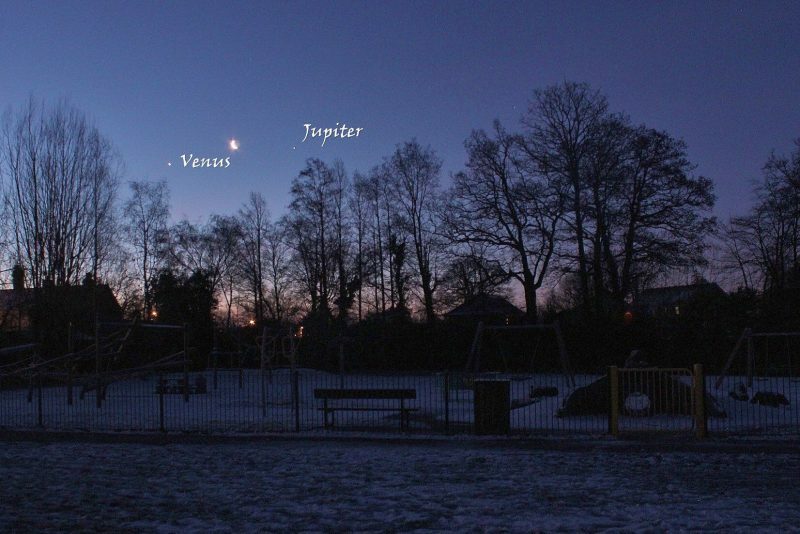 From top to bottom, this planetary lineup showcases Jupiter, Saturn and Venus. Wake up no later than one hour before sunrise to see the spectacle. Think photo opportunity! On the morning of February 27, 2019, the waning crescent moon closely couples up with the brilliant planet Jupiter as viewed from North America. Elsewhere around the world, the moon is not as close. From the world’s Eastern Hemisphere – Europe, Africa, Asia, Australia and New Zealand – the moon shines to the west of Jupiter on February 27. For all of us, Jupiter and our companion moon will appear very bright and close enough to make waking up early more than worthwhile. View at EarthSky Community Photos. | Steve Pond in East Grinstead, Sussex, England, caught the waning moon and planets the last time the moon moved through this part of the sky, in late January and early February 2019. The lighted side of a waning crescent moon points east, the direction of sunrise. The planets Saturn and Venus lie to the east of Jupiter, so the lit face of the moon will point toward the other two planets on the morning of February 27. Notice that the planets and moon make a line on our sky’s dome. This line shows you the whereabouts of the ecliptic, or Earth-sun plane. Since the other planets in our solar system – and the moon – all orbit more or less in this same plane, we often see them strung across our sky in this graceful line. Each morning – in the hour before sunrise – you’ll see the moon farther east relative to this lineup of planets. 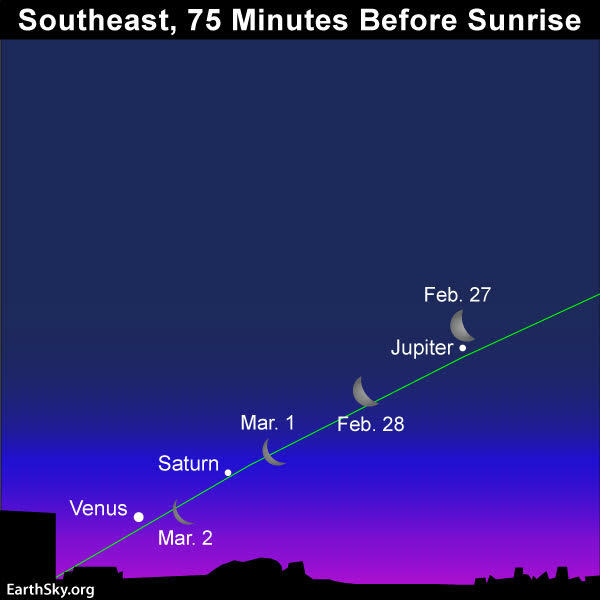 Watch for the moon to pass Saturn and then Venus, as it makes its way toward the sunrise. From various parts of Earth, the planets and moon will appear oriented differently in your sky. No matter where you live, though, fainter Saturn will lie between much-brighter Venus and Jupiter. Saturn, by the way, shines as brilliantly as a 1st-magnitude star. Jupiter outshines Saturn by about 11 times. And Venus outshines Jupiter by nearly eight times! All are bright. If your sky is clear, you’ll be able to see all three planets with the greatest of ease. After the moon drops out of the morning sky in early March, you can continue to find Saturn in between Venus and Jupiter for several months to come. Day by day, however, Jupiter and Saturn will drift farther west of Venus (opposite the sunrise direction) in the morning sky. By the way, when we see the moon as a thin crescent in our sky, someone on the moon would see Earth as almost totally full. The sunlight reflected from the nearly full Earth onto the dark side of the moon is called earthshine. Look for its ghostly luminescence on the nighttime side of the moon in the mornings ahead. Bottom line: A beautiful scene awaits you in the early morning sky. It’s a golden opportunity to see the moon sweep past 3 glorious planets: Jupiter, Saturn and Venus.